We happened to have a marketing assistant that spoke fluent Japanese, Ritzko Brady. She grew up in Japan, came to the US for college, and married an American. She spoke excellent English and Japanese. Before we went Terry Green had warned me that the Japanese would not take kindly to us bringing our own interpreter, and the fact it was a “she” and not a “he”. Our first stop was Sharp Electronics outside of Hiroshima. Sharp was using our product for optical scanners, the projections were for large numbers, but they had not materialized. When we arrived I told Mark Zadeh not to tell Tomen Ritzko spoke Japanese. Her English was good and many Japanese do not expect native born American Japanese to speak the language. She was introduced as my assistant. We sat at a large square table with a hole in the center. The Sharp General Manager and his assistants were on one side, Tomen was on one, and Ritzko, Mark, and I where on the other. Ritzko could translate in real time, so as the Sharp General Manager was speaking she was whispering what he was saying in my ear. In summary, they wanted to use the Future Domain product but were having trouble making it work. Tomen then said that the problem was US companies have bad quality, and that Tomen would accept all the Sharp shipments, open them, test them, and send them to Sharp. Of course this had nothing to do with the problem, which was software related, but Tomen could make money selling the fact the US products were substandard! I had Ritzko speak. Again, I did not need to pause, she translated in real time. I told the General Manager the problem was not reliability, but software, I would fly one of my software engineers to Sharp, and we would get the product working. I told them Tomen did not need to test the product, I would guarantee reliability worldwide, wherever my product was drop shipped. If we were not reliable I would pay Sharp. The general manager was very pleased. They planned to order 5,000 adapters if they could get the problems fixed, based on my promise, they gave Tomen the order on the spot. Back at Tomen, I talked to the sales manager. I told him, this time in Japanese through Ritzko, that if they EVER represent our product as less than perfectly reliable, I would pull the account immediately. I wanted clear, honest reports from our customers to us. To my knowledge Tomen never did that again. 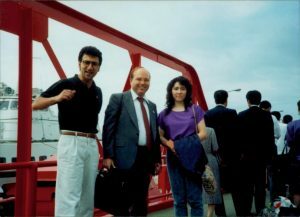 As far as the woman translator issue, a few years later the Sharp general manager confided in me that they always enjoyed my visits because of Ritzko. Since she left Japan as a teenager her Japanese was like a teenager, and they found that cute, in addition, since she spoke directly for me, they viewed her as a secretary, which was fine. And, they found her real time translation amazing, as most translators required the speaker to stop for a while to “catch up”. The Japanese loved our team, and we closed business at Sharp, NEC, Toshiba, Sony, and Panasonic. Within a year we had 90% of the captive CD-ROM business.